The Mature Traveller: Mussels - the new pub grub of choice? 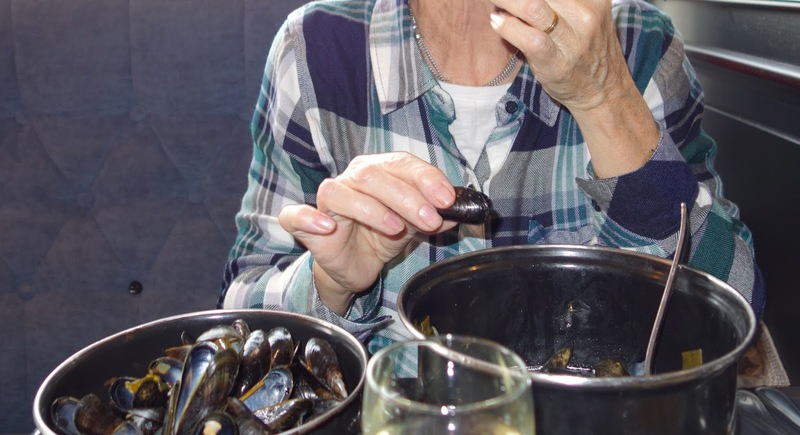 Moules frites and a glass or two of white are part of the ritual that is a weekend in northern France. Is it about to become part of the ritual that is the British pub lunch? This Easter weekend I ate Devon mussels in cider and cream sauce at Bel & the Dragon in the Surrey village of Churt. It was a late lunch. We had walked first with the grandchildren up the sandy rise known as the Devil's Jumps, for a grand view over that large stretch of heathland that embraces Frensham Ponds. Skylarks burbled but failed to drown the monotonous, two note, bicycle pump call of a chiffchaff. Vivid splashes of yellow gorse were already brightening a landscape darkened by rain clouds, but the storm held off until we had made it safely to the hotel restaurant. It's not, perhaps, a pub in the purist purists who like to grab a bar stool and down a been while hiking. It's one of a small chain of Home Counties inns with rooms,that concentrate on food, as such establishments must now in order to survive. It's certainly not the sort of place you would tramp into with mud caked boots. But the food is good and the service pleasant. Forsaking the usual mussels accompaniment of a Muscadet or something similarly crisp and dry, I had a beautifully kept pint of excellent T.E.A bitter from the Hogs Back brewery, not far away in Farnham. Ubiquitous though they are on the French coasts, mussels have remained something of a rarity on UK menus. These were delicious and as they came from northern waters (and there was an R in the month) I felt confident they wouldn't produce the dire reaction once suffered by the Mediterranean. It all led to a wandering chain of thought about how eating in Britain has changed in my lifetime, from the days when a terrine or a guinea fowl or a decent goat's cheese were pretty well impossible to find the side of the Channel. The fisherman who come to our local farmer's market already sell Dorset mussels. Might they become as commonplace as oysters in Dickensian London? Maybe it's better if they don't. Wonderful thought it is to get 50 kinds of French cheese at the supermarket it's good there's still the occasional treat you have to go abroad to find. Moles frites - mussels and chips just don't have the same ring.